is the marine standard, with a wide, stable image for tracking other boats, buoys and bridge numbers even in rough water. provide bright, sharply contoured images with natural color definition for outstanding viewing quality suitable for both beginners and professionals. Marine 7x50 is rated 4.8 out of 5 by 37. Rated 5 out of 5 by Wang from Great for Maritime Enforcement In short, these are great optics for maritime enforcement in the urban/marina environment, even in low light conditions. I was also pleased that I could simply put a NV monoscope up to one of the eye pieces or a cell phone camera against it to capture images. I have no problem acquiring vehicle plates and vessel hull numbers in low light at medium distance, sometimes even when targets are in motion. I had an issue with one of the diopters not adjusting properly a few months after I purchased these binos and simply sent them in for service. The turn-around time was reasonable. I will never buy another pair of manual focus binos. Rated 4 out of 5 by KeithK from Good value for the money These seem to be a good value for the money. The field of view is not as wide as the 7x50 military models but is quite acceptable. They advertise that once focus is set at 60' or beyond your good to go but I find that a bit optimistic. 100' or more would be more like it. This focus system is ideal if most of your subject's are at mid to long range i.e hunting, boating, landscape or an Air Traffic Controller etc. It's doubtful that these are "Made in Germany" as advertised on distributor websites as neither the binoculars nor the box they came in say one way or another. Only the plastic front lens cover says made in Germany. This would of course explain the large price difference between these and the Military models etc. Nonetheless they appear to be of good quality and value for the price. Rated 5 out of 5 by Bill from Great product I have the Marine 11 HD with compass, the clearest optics I believe I have seen. Very accurate compass. Would recommend to anyone. Rated 5 out of 5 by Captjack from Best for boaters As a sailor for several decades I have bought several pairs of binoculars.over the years. Most gave reasonable to poor service under in the watery environment of ocean sailing. More often than not after only short periods of time defects came into play. For years friends have told me about Steiner. Finally a few years ago I purchased my first pair. The visual clarity is astounding in all conditions which include nighttime use. I my Marine 7X50 for several years before deciding to buy a new set. The old ones had done their service plus. Once again, I found quality both in construction and design. I am very pleased with these and expect them to give me many years of use in the future. . Rated 5 out of 5 by SIskiyou Woodsman from These were a gift from my son...Wow It's funny because I had been thinking about buying a new pair of binoculars but not of this quality so I'm glad I didn't. The light gathering ability and clarity of the optics is nothing short of amazing! The fact that once set to your vision, they are in perfect focus from 60' to infinity is also awesome. I would call these super high definition 3D binoculars. Below is a photo off my deck, shot with my phone through one ocular lens. Rated 4 out of 5 by Sail Vessel from Stable and easy use. Purchased the Steiner optics for use on sailing vessel, light, easily focused and stable. Rated 5 out of 5 by Hetzer from Excellent Binoculars As soon as took them out of the box, I was impressed with the ease that my hands fit the binoculars. This design is very user friendly and allows secure grip. I followed the instructions in the booklet, focusing on a sign 100 + yards away and was delighted with the binoculars absolutely clear vision. The sports auto focus system works perfectly. I tried them again as it was getting dark and the lens still gave excellent celerity. This binocular is great for any outdoor task, that requires long distance clear vision. Are these binoculars suitable for wide field astronomy application? Thank you. Astronomy was never an intended use for our binoculars, but I have heard of folks having success with # 210 Military marine 10x50 for that application. I wouldn't recommend the Marine binos due to their blue lens coating, which would block certain wavelengths of light that you may actually be looking for. On the high-end, the Military 15x80 and 20x80 would be the best thing for this application. Do they have a range finder ? The right lense has water in it from hunting in a downpour. How can I dry them out? How to maintain exterior cover, Vaseline, oil or? We recommend mild dish soap, and warm water. Is there a tripod adapter for the Steiner 7x50 Marine binoculars? I would like to dual use the binoculars for digi-scoping. are these the best choice of binoculars for &nbsp;sport fishing in the ocean? 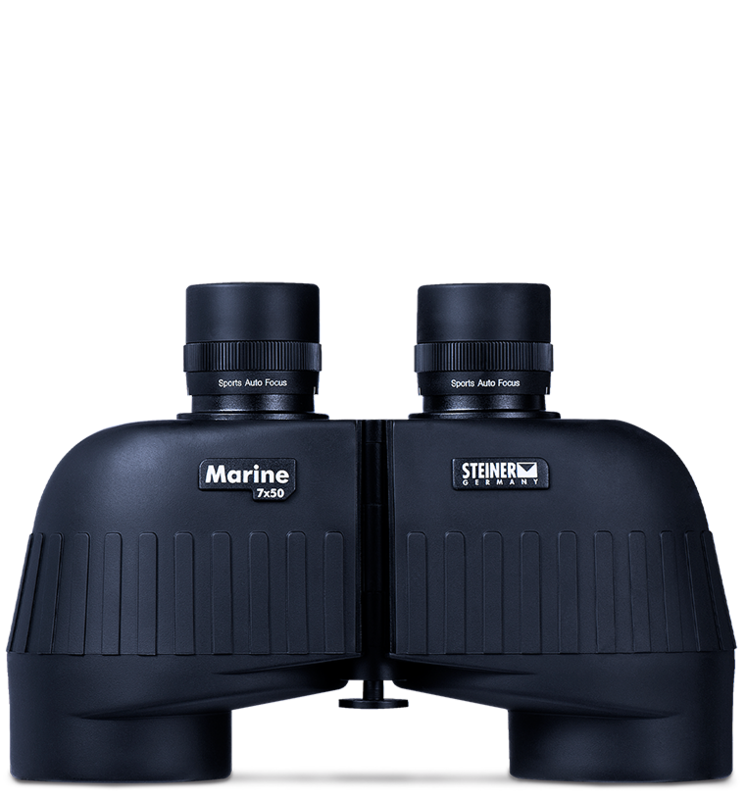 Hello, The Marine 7x50 are a good entry level binocular for ocean fishing. If you wanted the next model up i would look into the Navigator Pro model. They are a step up from the Marines in glass coating as well as they are submersible under water. What is the actual warranty period for these binoculars?